(Nanowerk News) Biologists at the California Institute of Technology (Caltech) have worked out the details of a mechanism that leads undifferentiated blood stem cells to become macrophages—immune cells that attack bacteria and other foreign pathogens. The process involves an unexpected cycle in which cell division slows, leading to an increased accumulation of a particular regulatory protein that in turn slows cell division further. The finding provides new insight into how stem cells are guided to generate one cell type as opposed to another. Previous research has shown that different levels of a key regulatory protein called PU.1, which is involved in the new cycle, are important for the production of at least four different kinds of differentiated blood cells. For example, levels of PU.1 need to increase in order for macrophages to form, but must decrease during the development of another type of white blood cell known as the B cell. Precisely how such PU.1-level changes occur and are maintained in the cells has been unclear. But by observing differentiation in both macrophages and B cells, the Caltech team discovered something unusual in the feedback loop that produces macrophages. Their findings appear in the current issue of Science Express ("Positive Feedback Between PU.1 and the Cell Cycle Controls Myeloid Differentiation"). "Our results explain how blood stem cells and related progenitor cells can differentiate into macrophages and slow down their cell cycle, coordinating these two processes at the same time," says lead author Hao Yuan Kueh, a postdoctoral scholar at Caltech who works with biologists Michael Elowitz and Ellen Rothenberg, who were both principal investigators on the study. "We are excited about this because it means other systems could also use this mechanism to coordinate cell proliferation with differentiation." In the study, the researchers captured movies of blood stem cells taken from transgenic mice. The cells expressed a green fluorescent protein that serves as an indicator of PU.1 levels in the cell: the brighter the cells appeared in the movies, the more PU.1 was present. By measuring PU.1 levels over time using this indicator, the scientists were able to monitor changes in the rate of PU.1's synthesis. PU.1 can work through a positive feedback loop, binding to its own DNA regulatory sequence to stimulate its own production in a self-reinforcing manner. This type of loop is thought to be a general mechanism that allows a stem cell to switch into a differentiated state. In the case of PU.1, the process cranks up to produce macrophages, for example, and turns down to produce B cells. And, indeed, when the researchers looked at B cell development, they saw what they expected: developing B cells decreased PU.1 levels by putting the brakes on the production of the protein. The surprise came when they observed macrophages. Although the amount of PU.1 in the cells increased when the stem cells became macrophages, the researchers saw no change in the rate of PU.1 synthesis. So where was the increase coming from? Upon investigation, the researchers observed that cells increased their PU.1 levels simply by slowing down their rate of division. With fewer cells being produced as the rate of PU.1 production marched steadily on, higher levels of the PU.1 protein were able to accumulate in the cells. Indeed, by slowing down the cell cycle, the researchers found that they could raise PU.1 levels enough to prompt the generation of macrophages. This result suggested that a different type of positive feedback loop might be responsible for the decisive final increase in PU.1 levels during macrophage differentiation. "This work shows the amazing power of movies of individual cells in deciphering the dynamics of gene circuits," says Elowitz, who is a professor of biology and bioengineering at Caltech and an investigator with the Howard Hughes Medical Institute. "Just by following how the amount of PU.1 protein changed over time in a single cell, one can see directly that cells use a very different kind of feedback architecture than we usually associate with cellular differentiation." Time-lapse movie of blood progenitor cells dividing and differentiating in culture. The brightness of green fluorescence indicates the amount of the regulatory protein PU.1 present in each cell. 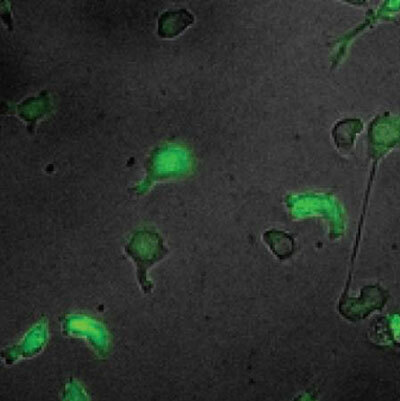 Green fluorescence images are acquired at a lower frame rate compared to the gray bright-field images of the cells. Time is given in hours. To test what kind of positive feedback loop might control these events, the researchers forced cells to express extra PU.1, and measured its effect on the cells' own PU.1. They found that the extra PU.1 did not boost the cell's own PU.1 synthesis rate any further, but instead slowed the rate of cell division, causing PU.1 to accumulate to higher levels in the cells—an effect that slowed the cell cycle further. "The key to this mechanism is that PU.1 is a very stable protein," says Rothenberg, the Albert Billings Ruddock Professor of Biology at Caltech. "Its central role in blood cell development has come from the fact that it collaborates with different regulatory protein partners to guide stem cells to make different cell types. We've known for some time that the exact ratios between PU.1 and its partners are important in these decisions, but it has been hard to see how the cells can manage to control the balance between so many of these different regulators with such precision. The beauty of this mechanism is that this ratio can be controlled simply by altering cell-cycle length. This shows us a new tool that factors like PU.1 and its collaborators can use to guide stem cells into precise developmental paths." The team also used mathematical modeling to test the properties of a feedback loop that relies on the length of the cell cycle. They were able to show that a system that incorporated both the new loop and the PU.1-production feedback loop was able to account for three distinct levels of PU.1—one corresponding to B cells, one to progenitor cells, and one to macrophages. "That was a proof-of-principle that this type of architecture can work," Kueh says. "The modeling will also help us to generate predictions for future studies."